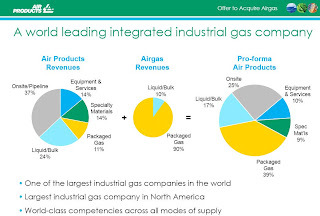 Airgas has just been offered a PRETTY price, sending shares up over 40% today as the stock outruns the offer price of $60. I say take it, because with their cost structure it would be very difficult to achieve results that will drive the share price this high without a deal. 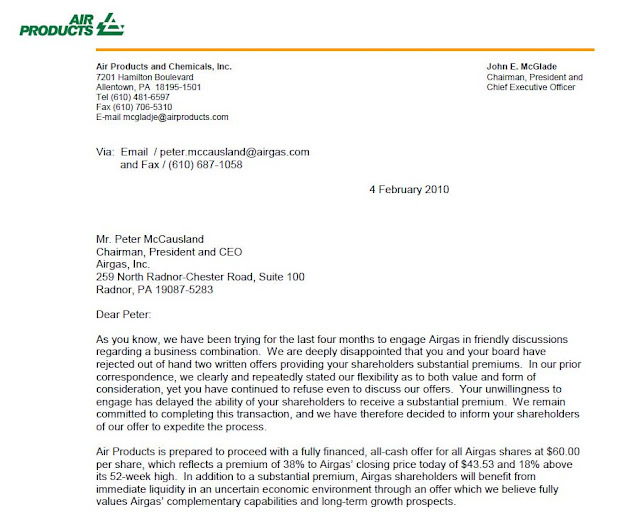 After Airgas (ARG) management rebuffed behind-the-scenes buyout offers from Air Products (APD), APD management has launched a hostile bid. And a pricey one at that, causing multiple analysts to downgrade the stock(APD) this morning. And if anyone didn't think APD was quite serious and sincere about this offer, check out the entire web page dedicated to the deal's details. From the letter outlining the offer, APD CEO John McGlade outlines his disappointment that the ARG board turned down his previous offers. But if those offers were at lower prices - thus encouraging this higher $60bid - then CHEERS to APD's board for extracting full value for shareholders! Best part for Airgas? It's an ALL CASH deal, so no worries about being handed APD stock that could fall. APD is going to make this an all cash deal, but they've only got $300million in cash = head to the debt markets. Probably a good call, but they had better get some GREAT financing. They're going to have to work pretty hard to make this deal accretive in any reasonable time frame, given the extremely rich Free Cash Flow Yield of 3.8% on this deal. APD is paying 19 times forward earnings if this deal goes through, versus their own valuation of 14 times 2011 expectations. That and the tiny FCFY% is likely why APD shares are off NINE PERCENT today. Even looking back, it's hard to get to a level of earnings that justify this price. I will say that ARG might have been "over-CAPEXING," if you will. 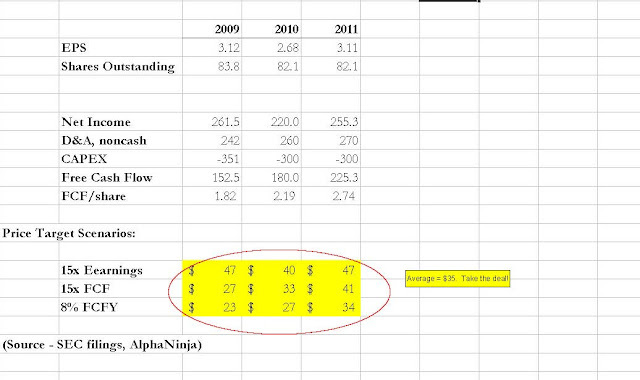 Meaning that APD might swallow them up, reduce CAPEX and enjoy the depreciation's boost to Free Cash Flow. The presentation highlighting the deal rationale is good, but it really could have been summed up another way, simply by saying "Hi. You have DOUBLE our gross margins (55% versus 26%), so we'd like to buy you out, fire everyone but your sales staff, and boost our profit margins massively. Cool?"